New product will preview in beta at Encounters Film Festival, 25th – 30th September at Watershed. 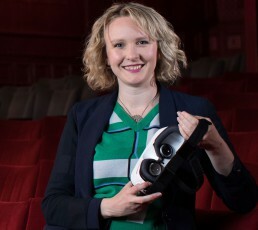 The software system, officially releasing in early 2019 will allow arts venues and cultural attractions to set up their own virtual reality theatres in existing spaces. Groups of ticket-holders can experience curated selections of VR experiences, simultaneously. After two years of extensive research and testing, Limina saw the high demand from mainstream audiences for artistic VR, including at last year’s sold-out Limina VR Weekender with Watershed. Limina and Zubr plan for the app to get VR to at least 100,000 audience members in 2019. This new straightforward and scalable solution makes it easy for venues to capitalise on audience demand for all things immersive. The teams’ joint analysis has demonstrated that this product has the potential to disrupt the out-of-home digital entertainment sector, boosting the South West’s global reputation in VR and bringing jobs to the area. The new product will be used throughout Encounters Festival next week in Watershed – the longest running short film and animation festival in the UK. Zubr are a commercially orientated VR development company who invest significantly in their own R&D. As well as being Limina’s software development partner, they are also investing in Limina. Zubr have previously provided in-location VR solutions for venues including the Eden Project and We the Curious, where their experiences have amassed over 25,000 unique users.